Denis Nayland Smith is an agent with British Intelligence. 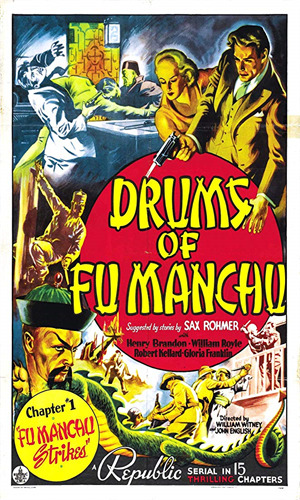 Fu Manchu (often but certainly not always spelled Fu-Manchu) is the leader of the infamous Si-Fan international criminal organization and arch-enemy of Smith. When we first meet the two, Smith was working as a "roving commissioner" in the British-controlled Burma. He had obviously been so for a while because his influence was considerable and his knowledge impressive. He had originally been working for the Colonial Police but eventually received this fiat to expand his area of operations. Some later analysts would claim, perhaps rightly so, that he was already working for British Intelligence when he began his "roving" while others have felt he would only later start working for them. Since his authority came from the Home Office, the differences seem small as the results were pretty much the same. 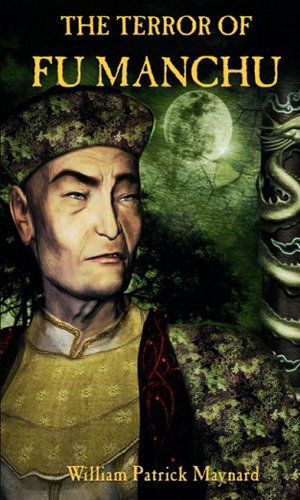 There is not a lot written about the man himself which is astonishing considering that the written accounts of his exploits would encumbrance more than a dozen full-length books and forty years of service for his Empire and against his nemesis, Fu Manchu. He is first described as a "tall, lean man, with his square-cut, clean-shaven face sun-baked to the hue of coffee." We know by inference that he is likely in his mid-30s at least to have attained his rank. We must assume that he is single for he never mentioned a wife, late or otherwise. Beyond the fact that he knew the man who chronicled the first three of the adventures, Dr. Petrie, from many years before, likely university but perhaps before that, we know nothing of his early years or how he got himself stationed in Burma. There is a whole lot of not much in Nayland Smith's life story. The same cannot be said for his enemy, a man whose actions have resulted in his acclaim and his notoriety which far exceeds that of Smith, the man devoted to stopping his every foray into the West. 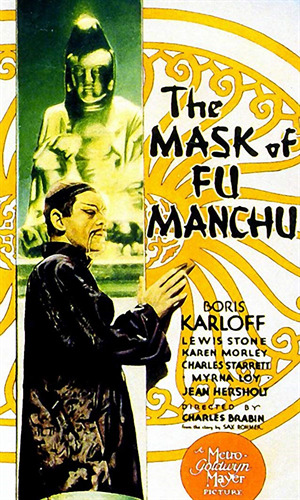 Smith's initial description of Fu Manchu is "Imagine a person, tall, lean and feline, high-shouldered, with a brow like Shakespeare and a face like Satan, a close-shaven skull, and long, magnetic eyes of the true cat-green. 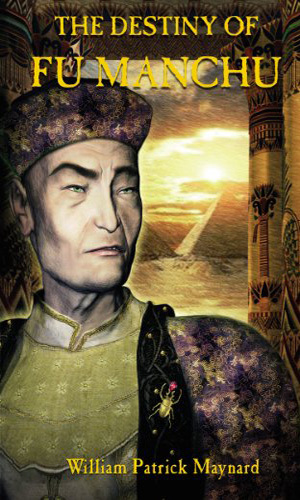 Invest him with all the cruel cunning of an entire Eastern race, accumulated in one giant intellect, with all the resources of science past and present, with all the resources, if you will, of a wealthy government - which, however, already has denied all knowledge of his existence. Imagine that awful being, and you have a mental picture of Dr. Fu-Manchu, the yellow peril incarnate in one man." The age of Fu Manchu is really anyone's guess. We learn over time that he has perfected an elixir which has greatly prolonged his life and kept him in obvious very good health. It is written that he has several doctorates from Western universities and is a genius in several fields with chemistry being a predominant one. As he has at least one full-grown daughter, as we learn over time, he must be a minimum of 40 years but likely, considering his influence, considerably more. The Si-Fan organization with which he is affiliated is international in scope but largely Asian, spanning from India to northwest China but it is the region of southwest China that seems to draw him the most; Tibet to Burma. 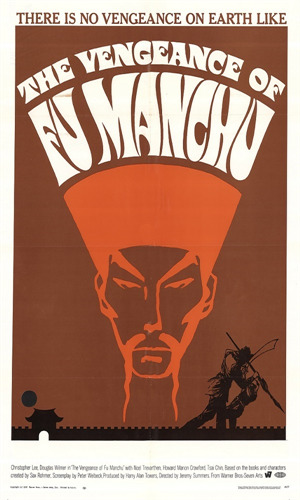 At first it would seem that Fu Manchu was but one of the leaders of Si-Fan for there are stories of animosity and out-right revolt in that group and there are even reports of Fu Manchu being considered a renegade with a price on his head from his colleagues. How true these might be is unknown but whatever discord that might have existed will eventually be quelled and Fu Manchu would become the unopposed head. Nayland Smith (he seldom used his first name) would receive a Knighthood for his saving of London from Fu Manchu and would see his area of operations become global as he would operate across Europe, spend considerable time in the Middle East (especially Egypt), and then head West to the Americas where he would work closely with the FBI. In all this time there would be long periods where his enemy, Fu Manchu, would be quiet and unheard from and what Smith worked on then is never mentioned but each time Fu Manchu got active, Smith would be there to combat him. Smith could never hope to match Fu Manchu in the brains department and he would several times admit quite honestly that his successes were largely a matter of luck and stubborn determination rather than strokes of genius. But succeed he would, over and over, though the ultimate prize of capturing and eliminately his opponent would always be beyond his reach. Amazingly, though, for all his accomplishments at fighting such a powerful foe and stopping that man's global reach, if you were to mention to the man on the street the name Nayland Smith, you would surely get a blank stare. Mention his enemy, Fu Manchu, though, and it would be a whole different reaction. Even here, though both are listed in the index, it is Fu Manchu that has the title. Certainly Smith never got a mustache named after him. 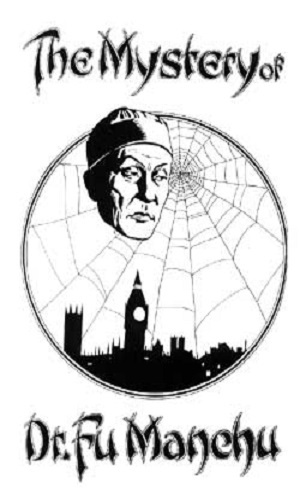 Numerous English citizens who were prominent in Indian politics are being assassinated and Nayland Smith is on the hunt of the kingpin behind the killings, the diabolical Dr. Fu Manchu. It has been two years since Nayland Smith and his friend, Dr. Petrie, thwarted Fu Manchu's plot. It seemed just a matter of time before the evil mastermind would return and now he has. A British attaché in Peking has raced to London to meet with Nayland Smith but before the two can get together, he is attacked and is only barely able to impart a few words to let Smith know something is up with the notorious Si-Fan criminal organization plotting something in the region of Tibet. Strange things are awry in Egypt. The head of a dig there has suddenly died and then his assistant receives a secret message that the man is still alive. When the assistant appeals to Dr. Petrie for help, the two head down a path that will take them, and Nayland Smith, up against the daughter of Fu Manchu who learned a lot about evil from her father. As a nasty epidemic spreads all along the Riviera, the French authorities call upon Dr. Petrie to assist in learning the cause and finding an antidote. 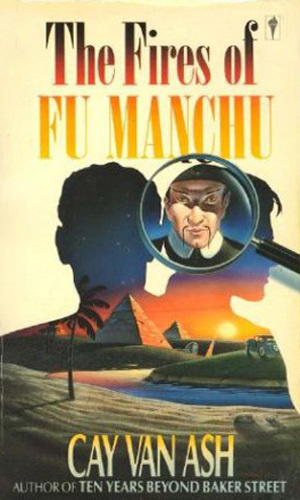 He in turn comes to realize that it is likely Dr. Fu Manchu who is behind it all and seeks out Nayland Smith for help. It looks like the end for Dr. Fu Manchu as he is trapped in London, unable to get to his normal resources and even worse, his elixir that keeps him alive. That does not stop the evil mastermind from causing trouble and it is up to Nayland Smith to foil his plots. 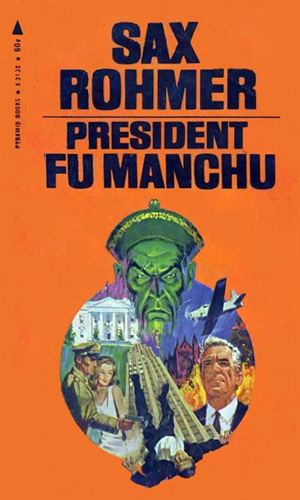 Heading to the United States for the first time, Dr. Fu Manchu has a plan to take over the country by eliminating the leading Presidential candidate, moving his man into the lead. Nayland Smith heads to Washington to work with the FBI to stop him. 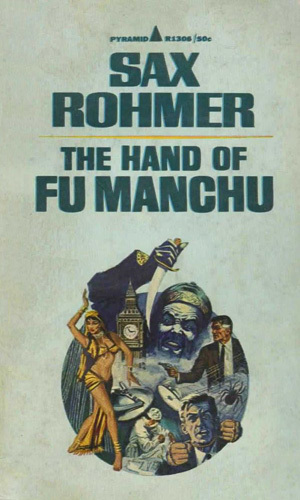 In the days leading up to WWII, Dr. Fu Manchu has the idea of killing off the dictators around the world and stepping into the vacuum of power left behind. Nayland Smith wants to keep the peace by stopping the plan. After nearly a decade with no word about his activities, Fu Manchu reappears on the global stage in a daring attempt to wrest control of China from the Communists. Nayland Smith as always wants to stop his arch-nemesis but something seems very off with Smith. With the Soviet Union and Red China no longer allies, a new force has shown up in northern China to cause trouble all around and in doing so, take control. It is the Si-Fan under the leadership of Fu Manchu and he is using zombies to be his pawns. Dr. Petrie arrives in Sussex, England, in the spring of 1914 to get the aid of the retired Sherlock Holmes to go up against Dr. Fu Manchu after Petrie's friend, Nayland Smith, has been kidnapped. The year is 1916 and the place is Cairo, Egypt. Dr. Petrie receives a late-night visitor at his practice, a beautiful young Asian woman who before he knows it sheds her sole garment and begins to seduce him. The arrival of Nayland Smith ends that ploy and also saves Petrie's life. It also puts them again on the trail of the father of the visitor, Dr. Fu Manchu. 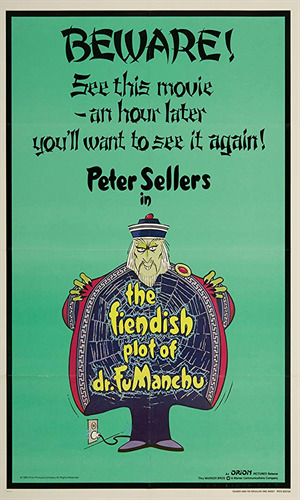 "The death of a seemingly respectable missionary draws Denis Nayland Smith and his devoted companion, Dr. Petrie, back into the web of the diabolical Dr. Fu Manchu. The investigation takes our heroes on a harrowing journey where they cross paths with the Si-Fan, a rival theosophist society and the famous French detective, Gaston Max." First appearing in the Storyteller in October, 1912. 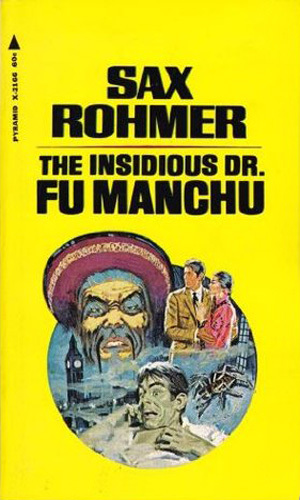 It later made up chapters 1-3 in The Insidious Dr. Fu Manchu. It introduces Nayland Smith and his friend, Dr. Petrie, and tells of the first encounter in London with Fu Manchu as he dispatches his targets with the mysterious Zayat Kiss. First appearing in the Storyteller in November, 1912. It later made up chapters 4-6 in The Insidious Dr. Fu Manchu. Nayland Smith works harder to learn why the notorious Doctor has come to England in the first place. First appearing in the Storyteller in December, 1912. It later made up chapters 7-9 in The Insidious Dr. Fu Manchu. Introduction to the Reverend J. D. Eltham as Nayland Smith recounts one of the chief causes of the Boxer Rebellion in China and how that lead to the rise in power of Fu Manchu. First appearing in the Storyteller in January, 1913. It later made up chapters 10-12 in The Insidious Dr. Fu Manchu. This tells of Sir Lionel Barton, adventurer extraordinaire, who is an expert in what is happening in Tibet and is a source of information for Nayland Smith and a threat to the plans of Fu Manchu. First appearing in the Storyteller in March, 1913. 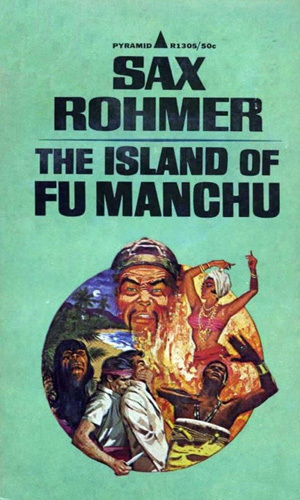 It later made up chapters 16-17 in The Insidious Dr. Fu Manchu. As the dragnet for Fu Manchu goes on, Nayland Smith and Dr. Petrie encounter a band of gypsies. Smith tries to arrest one wanted in Burma for murder but instead they capture Karamaneh, the mysterious woman who has twice saved Petrie's life. First appearing in the Storyteller in March, 1913. It later made up chapters 18-20 in The Insidious Dr. Fu Manchu. 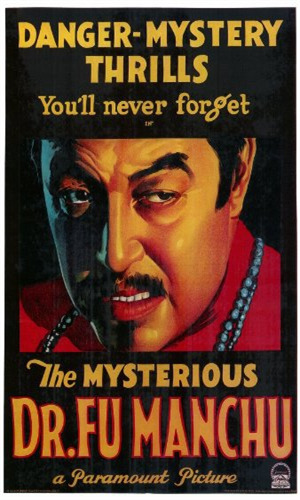 The title refers to the cryptic clue that Karamaneh passes to Dr. Petrie as he and Nayland Smith invade in disguise a club that may be a hideout of Fu Manchu. First appearing in the Storyteller in May, 1913. It later made up chapters 21-23 in The Insidious Dr. Fu Manchu. 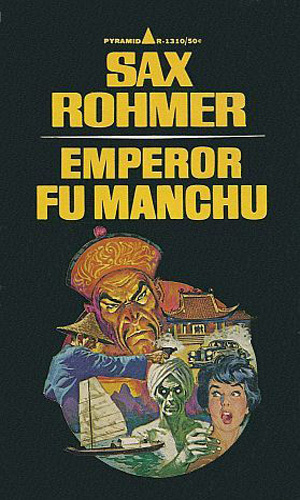 The intended victim of Fu Manchu in this story is Henry Stradwick, Lord Southery, who dies before Nayland Smith can arrive. First appearing in the Storyteller in June, 1913. It later made up chapters 24-25 in The Insidious Dr. Fu Manchu. 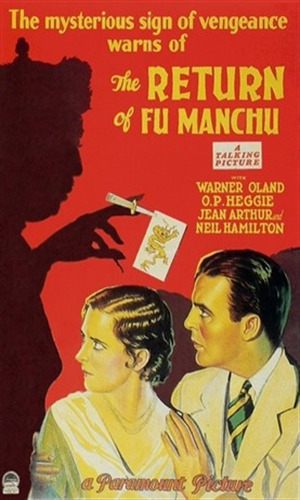 Dr. Petrie recounts a considerable amount of what is know of Fu Manchu's origins. First appearing in the Storyteller in July, 1913. 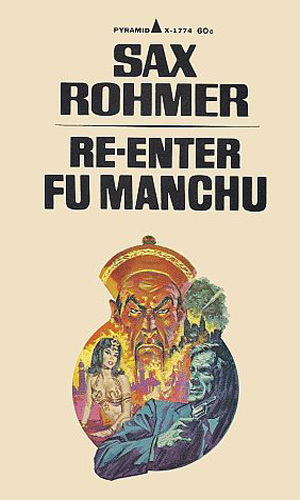 It later made up the final chapters 27-30 in The Insidious Dr. Fu Manchu. 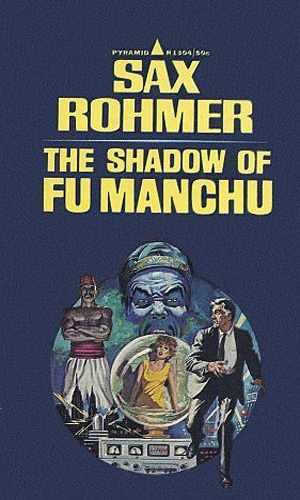 In the showdown with Fu Manchu, the police inspector helping Nayland Smith becomes a victim and to save his life, Smith must make a deal with the Devil Doctor. First appearing in Britannia & Eve in the UK and soon after in Colliers in the US, this is largely a rewrite of The Blue Monkey but with East being identified as Nayland Smith. Smith and Petrie are vacationing in Dartmoor when a young woman asks them to help find her missing dog. They go in search of the canine only to discover its body and later the body of the woman's father. That throws them into a mystery. Originally published in 5 parts in The Toronto Star weekly supplement from late January through February 1952. 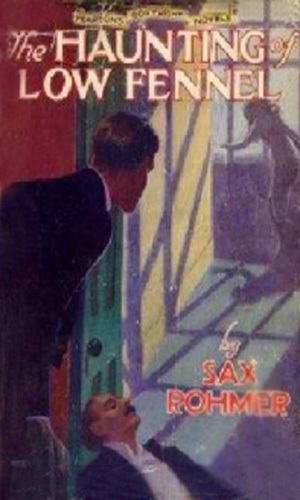 This novella makes the lead in the collection of the same name. It tells of the plot by Fu Manchu to use a weapon called the Runsen Beam to destroy all the gold in Fort Knox to ruin the US economy. Originally published in 2 parts in the This Week magazine in October of 1957. An American scientist working on ways to slow down aging is giving a lecture in the Sorbonne and Nayland Smith is certain that will attract Fu Manchu. 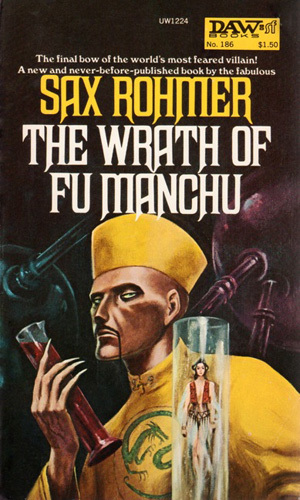 This story was included in the collection The Wrath of Fu Manchu. Originally published in the This Week magazine in March of 1958. In London, Nayland Smith heads to the flat of an undercover detective who has infiltrated the Si-Fan. The man is dead when Smith arrives but he does nab a beautiful Si-Fan operative who came to find a metal disc worn around the dead man's neck. 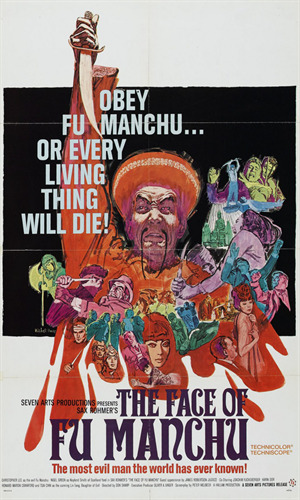 This story was included in the collection The Wrath of Fu Manchu. Originally published in the This Week magazine in February of 1959. A scientist working of anti-gravity propulsion is in London when his girlfriend is snatched by Fu Manchu. Nayland Smith steps in to help get her back. 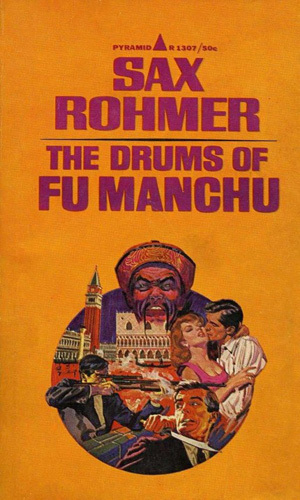 This story was included in the collection The Wrath of Fu Manchu. From IMDB: "A killer kitty with poison-tipped claws, giant noxious mushrooms and aphonia-inducing flowers are just some of the challenges faced by Sir Denis Nayland Smith and Dr Petrie in their battles against arch-villain Fu Manchu." This silent movie was initially a 15-part serial with each episode lasting 20-22 minutes. 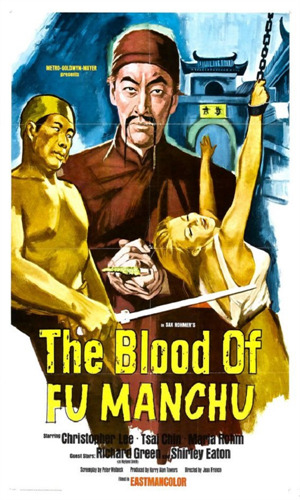 Fu Manchu's wife and child were killed by British soldiers during the Boxer Rebellion and he is out for revenge. 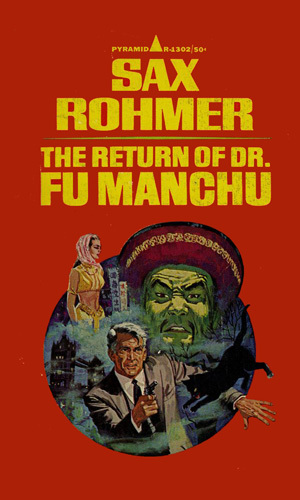 Still intent on getting his revenge, Dr. Fu Manchu returns. The race is on to find the tomb of Genghis Khan before Fu Manchu gets there and wins the treasure. Another attempt by Fu Manchu to locate the tomb of Genghis Khan to gain the power to conquer the world. 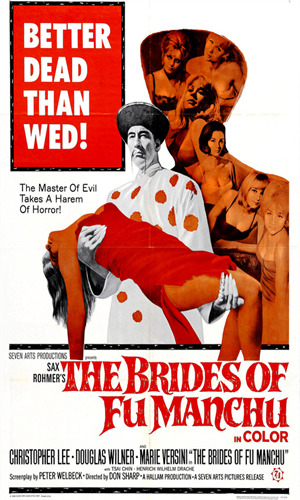 This was originally released as a multi-part serial lasting over 4 hours. 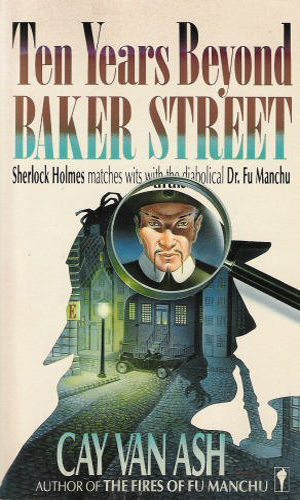 Nayland Smith is now certain that a series of murders in London point to the fact that Dr. Fu Manchu is still alive, despite being executed for his crimes. 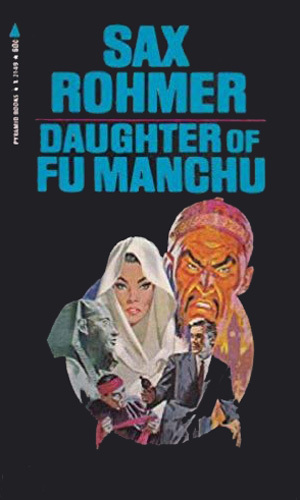 Capturing the daughters of prominent scientists and taking them back to his island headquarters, Fu Manchu is not asking a ransom for them but demanding these men help him build a death ray. Angered over his constant losses to Nayland Smith, Fu Manchu is now out to first discredit and then destroy the man. Ten women have been inoculated with a poison they will then spread to ten powerful men on the planet. An assistant to Fu Manchu accidentally destroys his supply eternal life elixir and now the bad doctor must steal many items to recreate it. Published by Detective Comics Inc. 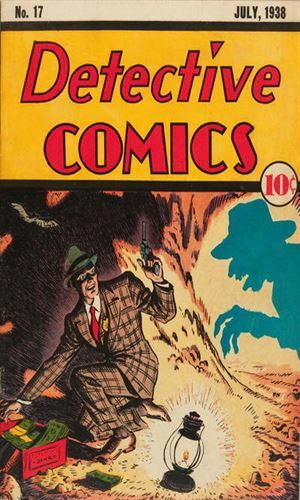 Printed in Issues #17 through #28 (12 issues) of Detective Comics. 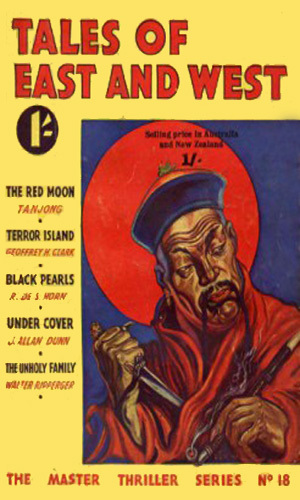 This was a graphic serialization of the first Fu-Manchu book. 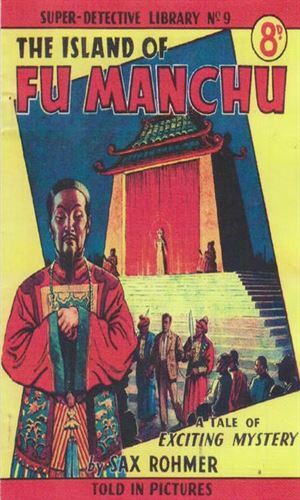 A One-Shot comic by the publisher that was a graphic format of the fifth Fu-Manchu book. 1. Superior Publishers Limited in Canada (August 1951) with same cover. 2. 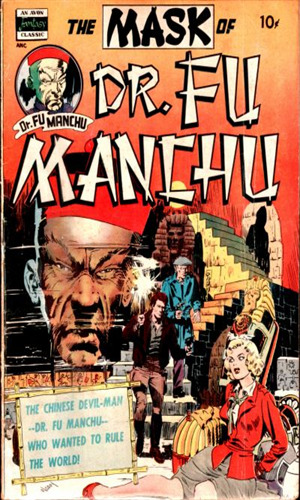 I. W. Publishing / Super Comics (USA- 1958) in Dr. Fu Manchu Comic. Printed in Super-Detective Library #9 with 64 pages. 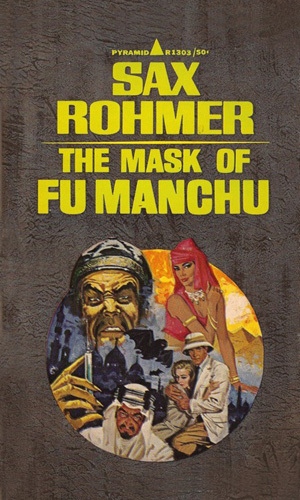 This was a graphic format of the tenth Fu-Manchu book. 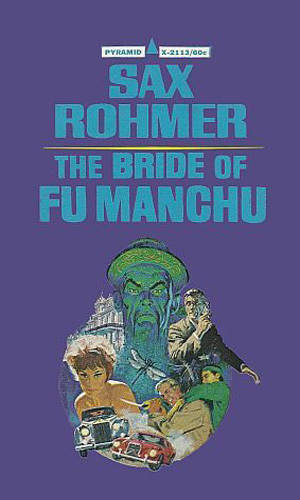 I really love the Fu Manchu books as a young teenager. This was around the time the Christopher Lee movies were coming out and while I never saw them then as they did not come to South Dakota as far as I knew, I did see pictures of them in magazines and was interested so grabbed the first couple of books. In the 70s I started them up again and read the lot of them. I still enjoyed them but it always struck me that Nayland Smith was definitely no real detective as he was always (IMHO) reacting to things and not really figuring them out on his own. As a result, it felt like he was accidentally successful too much. And the infamous Fu Manchu, genius and mastermind, sure picked a lot of inept people to do his bidding because he was always coming up short. One thing that did not occur to me but which I read a whole lot about now when talking about this series is the concept of the "Yellow Peril". I mean, I have read a good amount recently about the bigotry and fear-mongering about the danger from China that supposedly permeates all the books. I never saw it. 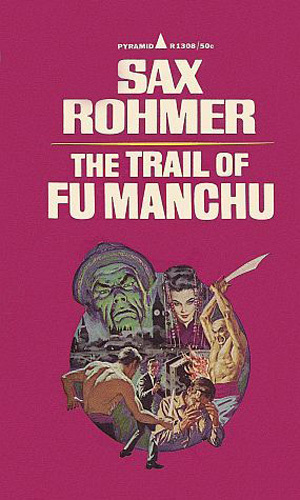 Of course, there is a ton of material in the pages about how dangerous and threatening Fu Manchu and his horde is but that was one group, not a whole race. Obviously I missed something and I think I'm better off for the oversight.